Tom Wood is the author of the Victor The Assassin thriller series. Reading the Tom Wood books in order means picking up his series which currently includes 7 main books and a short novella. Victor is the perfect anti-hero with his strange moral codes which you can’t but be impressed of. He keeps reminding me in a way of Dexter – the serial killer who again by any societal moral standards everyone should hate and abhor, yet you can’t but love (the two characters are very different from each other, however). Here are all the Tom Wood books in order of publication, with the reading order in brackets. Tom Wood was born in Burton Upon Trent in Staffordshire in England in 1978. He is currently living in London. Before becoming a full-time writer he held several jobs, including becoming a freelance video editor. Tom Wood mentioned in several interviews that he always loved writing. Creative writing was his favorite topic in class at school, however, the idea of becoming a full-time writer didn’t occur to him until he was already in his twenties. Before he became a writer, Tom Wood was a freelance video editor, but prior to that, he held several other jobs as well. His first book, The Hunter (published in 2011) introduces us to Victor, a ruthless assassin who works for the highest bidder. A character which by our moral standards everyone should hate, yet everyone ends up loving. The latest book in the Victor series by Tom Wood is called The Final Hour, published in 2017. The series will be adapted into a movie with the title The Killer by Studiocanal. Pierre Morel who directed Taken (played by Liam Neeson) will be directing the new movie as well. If it will be anything like Taken or District B13 or Non-Stop and Gunman, or even like The American Assassin, which was made into a movie in 2017 based on the same title novel by Vincy Flynn, it will be awesome. The Tom Wood books are all fast-paced and they are written in a cinematic style. The author mentioned that this style of writing suits the pacing of his novels and it suits Victor’s hitman jobs as well. There is no fluff, no extra in the books. Sometimes they feel almost like a movie script. Straight to the point. Victor is an assassin, a hitman. He is also an antihero with a strange moral compass. He has no crisis of conscience or remorse and has no qualms about killing anyone who needs killing and is not troubled by nightmares in his sleep thereafter. He is a very compelling character because he’s different from, say, Jack Reacher, Mitch Rapp or even Jason Bourne, all who do their things “for the right reasons.” The author always loved bad guys more than good guys, so for Tom Wood writing the character of Victor, the absolute villain, felt natural. Victor is very careful in his dealings with other people. You could say he is even paranoid, and one of his mottos is, when in doubt, just kill the other person to get your peace of mind. 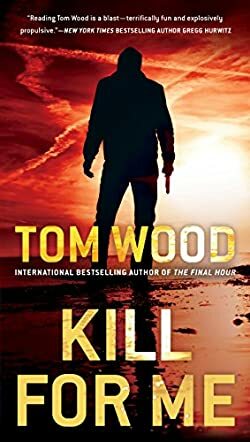 The Tom Wood book series is a fascinating one, and it’s interesting that these days there are many authors writing about assassins, about hitman working for the government, or a secret agency, or even for themselves. Jason Bourne and Jack Ryan might have been the first popular spy thriller heroes, but since then, many great authors, including Tom Wood, have brought their own spin onto the genre, much to the delight of their fans. In The Final Hour, the latest Tom Wood novel, Victor comes face to face with someone from his past: Raven, who owes him a debt from before. Not only that, but he is in the crosshairs of some very powerful national and international enemies, including the CIA. So when Victors knows that the only way for him to escape is to fake his own death, he knows that he needs help. And currently, the only person he can trust (at all) is Raven. And Raven knows that the only way to repay her debt to Victor is by helping him die. Just as the previous Victor the Assassin novels, The Final Hour is fast-paced nonstop action. There are very few breathing moments before the action picks up again with chases and hunts left and right. Victor is a meticulous person and even paranoid. He won’t take action before he plans his next moves down to the smallest of details. And that is in all the Tom Wood series, not only in the latest book. If you’re wondering whether you should read the Tom Wood books in order for his Victor the Assassin series, I suggest you do. Victor is a strange character, but one that rapidly grows on you. However, you do need to start at the beginning to really try to figure him out. Even now with the release of book #8, Kill For Me, I’m still learning new things about him and proving myself wrong. Also, some characters like Raven appear in previous books as well, so it might be easier to keep everything in balance by reading the series in order.